When Noctua announced they had released 24-volt fans, I ignored it, asking, “What does that have to do with me?” I had tried 24-volt fans from other manufacturers with unhappy results. But the Noctua rep told me “They actually run nice and quiet in 12V PC environments!” It was at that point I had to test these fans to see how well they do. Do they really run quietly at 12 volts? And how strong are they? Immediately thereafter, Noctua announced their Chromax line of accessories. From having these two releases coming so close together, this combined review was born. 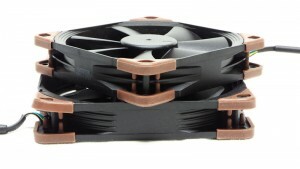 For its tenth anniversary, Noctua has introduced a new look for their website. It has a cleaner, white theme. It’s nice. Worth a look. 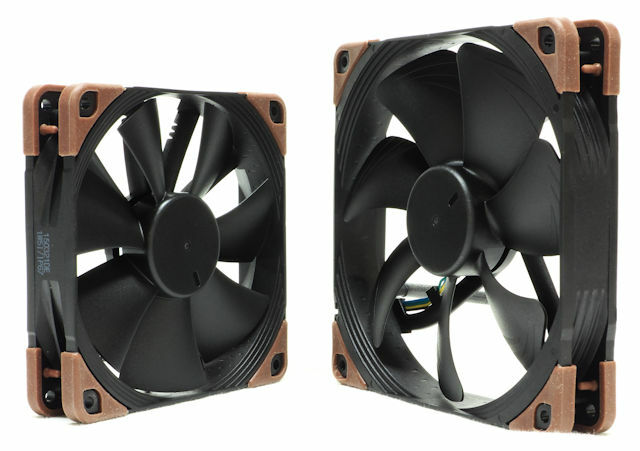 Conceived for industrial heavy-duty applications that require enhanced cooling performance and advanced ingress protection, Noctua’s industrialPPC (Protected Performance Cooling) line comprises ruggedised high-speed versions of the company’s award-winning retail fans. The new 24V models use a dedicated wide input range version of Noctua’s NE-FD2 three-phase motor driver IC in order to support 24V-based industrial applications and to provide moderate speeds and lower noise levels in standard 12V PC environments. Our industrialPPC fans feature a ruggedised, fibre-glass reinforced polyamide construction, water and dust protection up to standard IP67 as well as a novel three-phase motor for unprecedented energy efficiency. On the same page, Noctua promotes their services for non-PC applications. If you like stories, some of them on that page and other stories linked to it are pretty interesting. The IP in IP67 stands for ‘ingress protection.’ IP67 means the device will withstand all dust and immersion up to 1 m (you can read more about it here). You really can dunk these things in water down to arm’s length and still have them run at spec. I have done it. 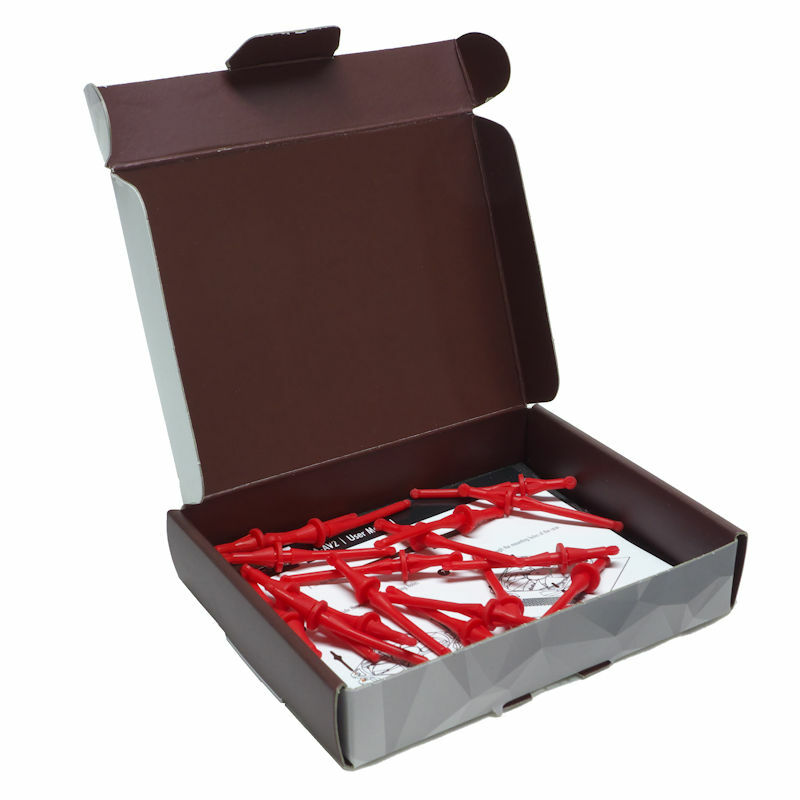 They are encased in nice cardboard boxes (shown below). Inside the boxes they are ensconced in cardboard holders so that the entirety of the packaging can be recycled. The boxes show all the specs of the fans at 24 volts, yet they are demure and show off no flashy marketing. Either Noctua is going for the classy look or they expect to sell these by mail, not off-the-shelf. Note that these boxes do not have a back plane with a hole for hanging them from a rack (though a sticker could easily be added). A head-on view shows the exhaust side of the 24 volt fans. Noctua . 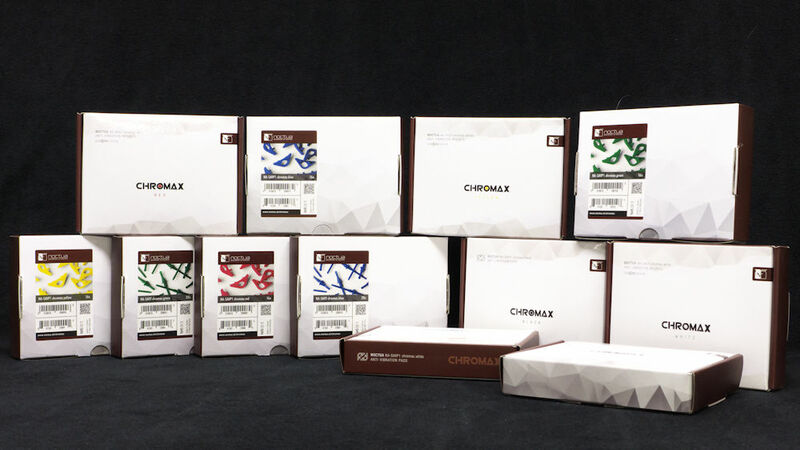 . . introduced its chromax line of anti-vibration parts that give users the option of colour-customising their fans to match individual build colour schemes. Available in red, blue, green, yellow, black and white, the chromax versions of NA-SAV2 anti-vibration mounts and NA-SAVP1 anti-vibration pads are ideal for colour-coordinating Noctua’s black industrialPPC fans with other components and popular build themes such as all black, black & white, black & red or black & blue.
. . . 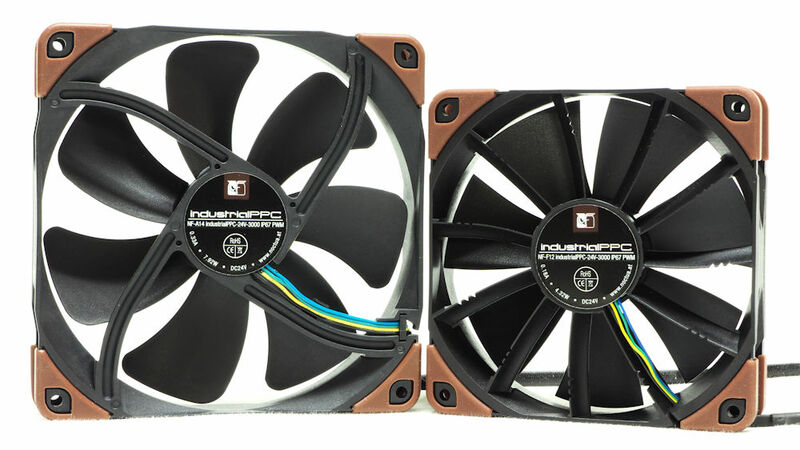 The new NA-SAVP1 kits now give them the option of matching their iPPC fans to various build themes by simply changing the supplied anti-vibration pads for chromax ones.
. . . 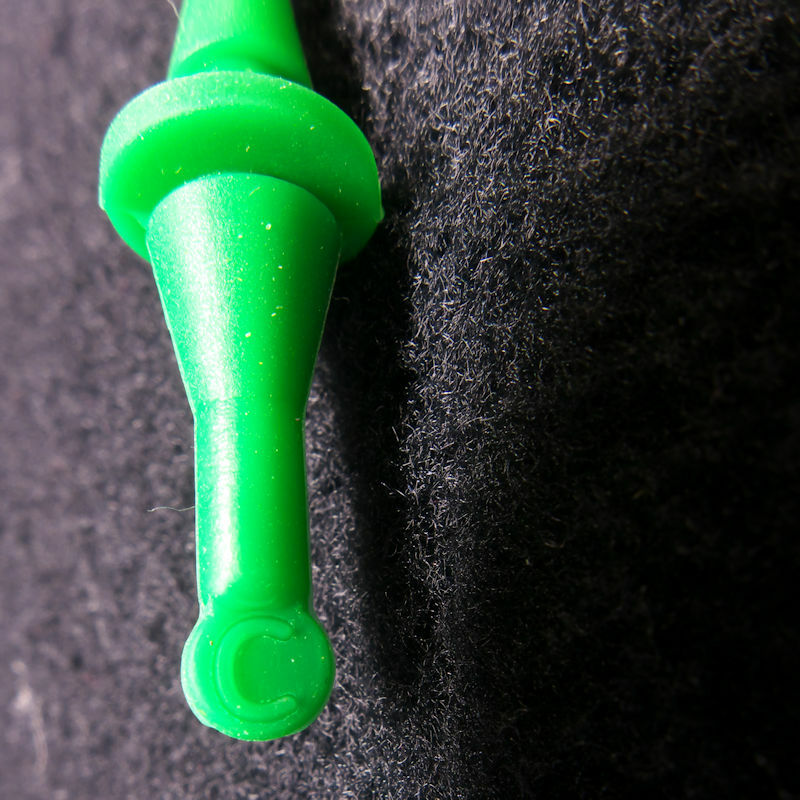 Both the NA-SAV2 and NA-SAVP1 parts are made of premium-grade silicone that is extra soft and highly tearproof at the same time, thus combining efficient decoupling with excellent longevity and ease of use. While the NA-SAV2 kits include 20 anti-vibration mounts for 5 fans, the NA-SAVP1 kits include 16 anti-vibration pads for 2 fans. 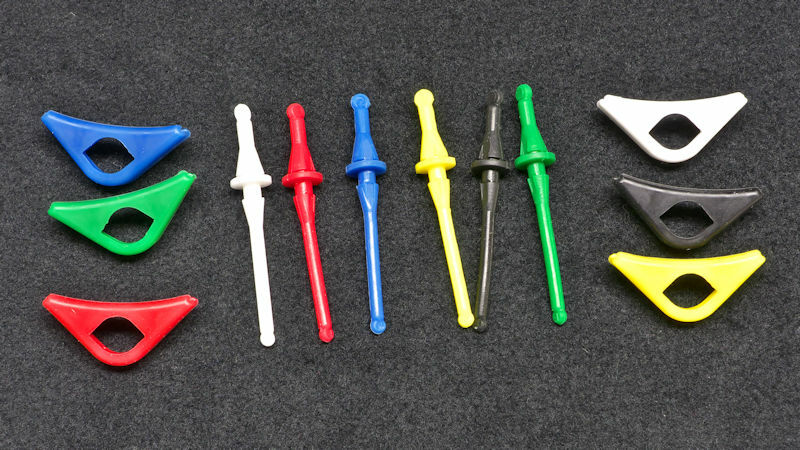 Notice the the vibration isolators have collars on them between the short ends and the long ends. The short ends you push through the screw-holes on the outside of cases. The long ends thread through screw-holes on the fan. The little gap between the collar and the long end is the place where the flange will go. So you see the collar will sit between the fan and the case. This can turn a loud case to a quiet one. Inside the boxes are 16 pads or 20 vibration isolators. 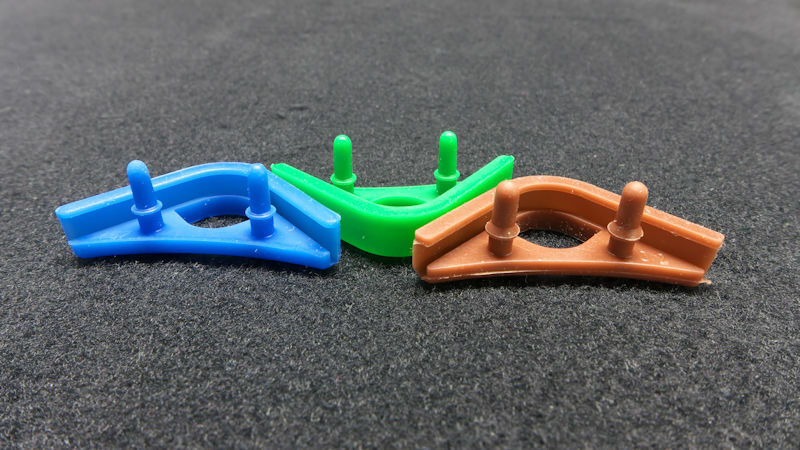 The nice thing about the vibration isolators (Noctua calls them “anti-vibration mounts”) are threefold: they are made of vibration-killing silicone, they are extra-long, so you can stick them completely through a fan and pull on the end to snap it into place, and they are double-ended, so they can be pulled through your case. This last is extremely helpful when you are dealing with blind corners. The boxes contain flat foam padding which the pads/mounts sit on as well as the vibration isolators come with an instruction sheet. 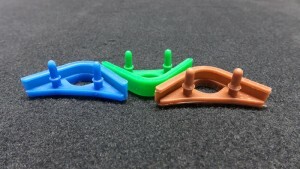 Note that the pads are made to stick through their mounting holes and hold. 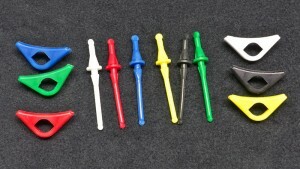 You can either push so that the pads deform and the pegs push through, engaging the catches molded into the pegs; or you can grab the ends of the pegs with your needle nose pliers as the pegs push through their holes. Here is what the pads look like when you have them mounted on fans. We are really putting these fans through their paces. 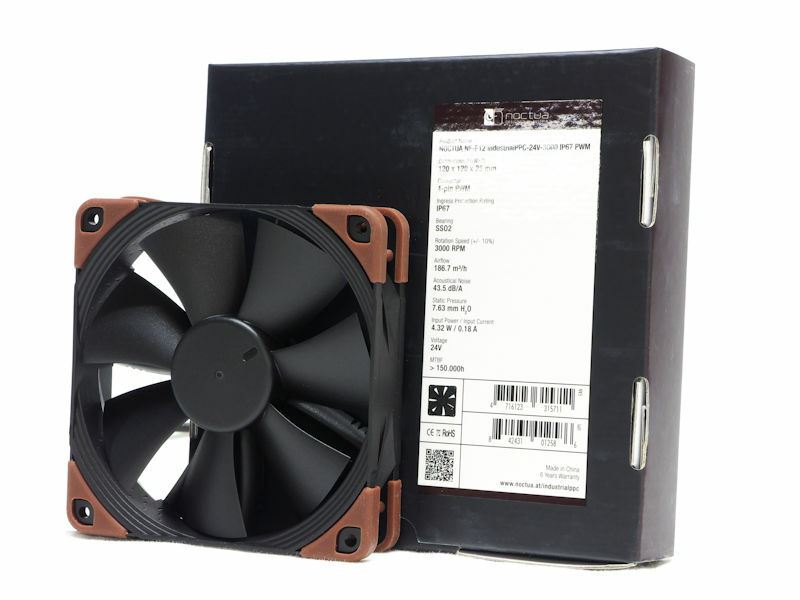 Noctua sent us two specimens of each fan, so we not only can look at their performance but their variability as well. Actually, Noctua sends two just in case one is a failure, but we can use this fact to demonstrate that specifications cannot be exact for any human-made object. We will look at the noise of these fans and their RPM, then we will look at their output directly. Next we will check their PWM response. Then we will see how they fit in as heatsink fans. 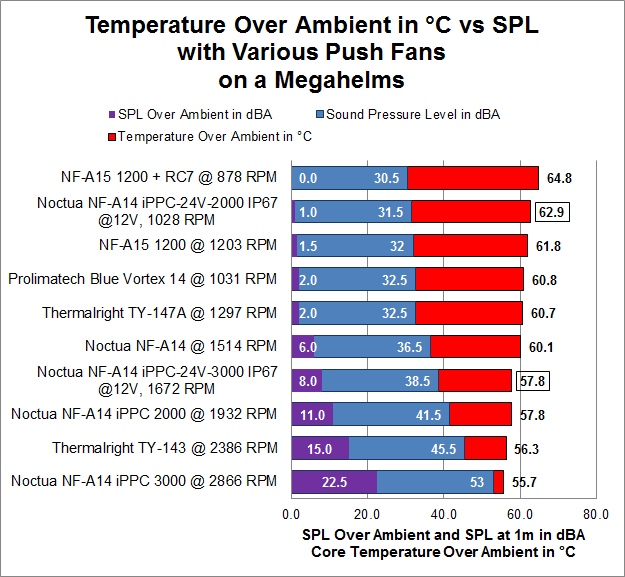 Finally we will look at SPL (Sound Pressure Level) vs cooling against ten fans we have already tested. So let’s get busy. First up, the free air RPM and SPL. This was measured at 10 cm, and extrapolated to 1 meter by subtracting 20 dBA from the result. This makes quiet fans measure louder than they really are, but the alternative is trying to measure the noise they make when that noise is less than the 30 dBA bottom limit of the Sound Level Pressure meter, which in this case was a Tenma 72-942. The RPM was measured by the motherboard’s utility. Next, the direct output. 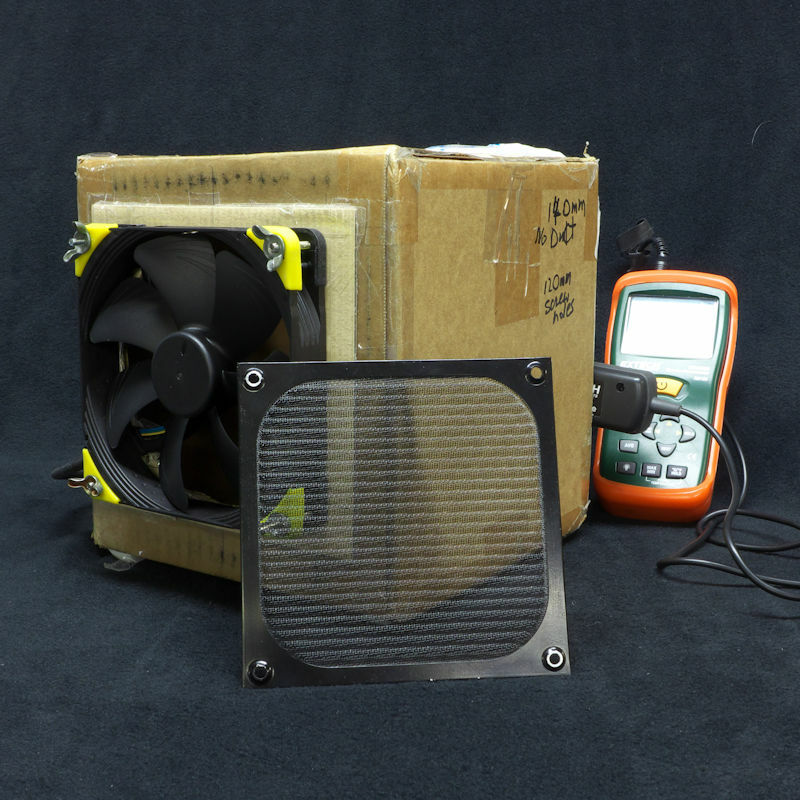 Measurement of a fan’s output is a matter of some discussion. 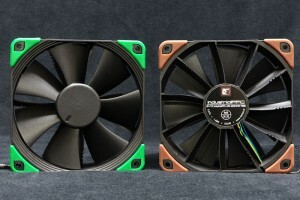 You can find some mighty fancy gear designed to measure a fan’s output, but little of that is devoted to measuring computer fans. So, I thought about it and I looked at the tool I had to measure airflow. It is an Extech AN100, which has a 72 mm measurement head which contains a small fan that is driven by the airflow you are measuring. It actually measures velocity, but multiplies that by the area of the duct you are measuring. While the anemometer was built to measure the wind in big ducts, it will measure airflow in small ones too. It then averages ten readings and outputs in CFM. The fan was first mounted on top of a rad, either a 30 FPI (fins per inch) radiator for each 120 mm fan, and a 16 FPI radiator for the 140 mm fans. 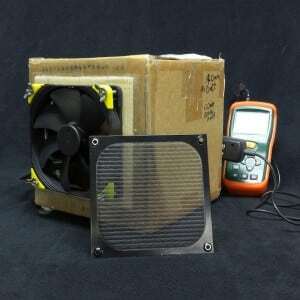 Each fan was then mounted directly to the measurement box, covered by a metal mesh dust filter for both sizes of fan. Finally each fans was allowed to blow unobstructed into the mixing box, an eight-inch cube. The anemometer head was put at the exhaust end, measuring the amount of air coming out. The box was sized to allow the fan output between the hub and the rim to mix before being measured. 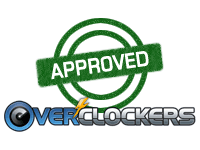 The next step in checking out these PWM fans is to record their RPM’s at various duty cycles. The motherboard driving these fans was able to adjust the PWM percentage. The response to duty percent was recorded in steps of ten – 100%, 90%, 80% etc. until the fan stopped. What was interesting about these fans was this: at a certain duty percentage, they would not respond. Even when the fan pulsed periodically (this was a built-in feature of these fans) the fans would stop. They could not even be restarted by spinning them. And then, when the duty was raised 2% — the smallest increment available – the fans were strong enough to start themselves, and did so. The table shows the RPM of each fan down to the lowest percentage each fan would run. Remember that these are 24 volt fans receiving 12 volts. Finally, we will look at the response of a heatsink to various fans. A single push fan was mounted to the heatsink. Set to 1.23 volts, reading up to 1.248 volts. Each fan had two runs on the Megahalems. Each test run was 30 minutes in duration. The last 20 minutes of each run was measured, and the core temperature logs were analyzed in Open Office spreadsheets. An Intel chip reports its temps in one degree increments, so for best accuracy these reports should be averaged in aggregate. Here the core temps were measured once a second, resulting in 1200-line spreadsheets. The digital thermometer measuring air temp reported its measurements in increments of 0.1 °C. The ambient temperature was measured every five seconds, resulting in 240-line spreadsheets. The mean ambient temp was subtracted from the mean core temps, resulting in a net temp for each run. Finally, the net temps were averaged. The Sound Pressure level was measured 1 meter from the heatsink, with the motherboard set vertically, the way it would in your case. The ambient noise for this testing was 30.5 dBA. So the net SPL is the sound pressure level measured at 1 meter, less 30.5 dBA. Noctua and Thermalright provided the fans being tested. The Megahalems was purchased retail in late 2009. Here is the first chart. It shows you how loud each one is. Then it shows you how much air it can push through a radiator. Remember that the 120 mm rad is 30 frames per inch, while the 140 mm rad is 16 FPI. Then you can see how fast each fan can draw air through a generic metal mesh. Finally, with an airpath not obstructed by anything. As predicted, this methodology tends to over-estimate fan noise. However, the fans are not loud. More importantly, they match or exceed their specs in output. From the results on the rads we can see that they push a fairly large amount of air through, all the while operating on half voltage. As a matter of fact, the 16 FPI rads don’t slow these fans down much at all. That would indicate a relatively high static pressure. 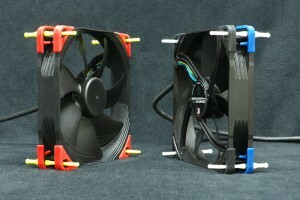 I received a question when I was discussing these fans: how slow can they go on PWM? The table below tells us: very slow — down to 123 RPM (and no, I would not have believed it either until I did it). 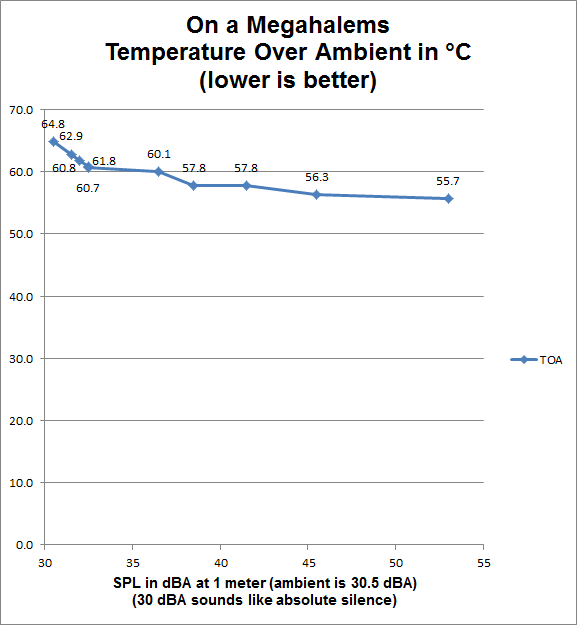 Some of you will remember that the Megahalems kept the first core of the same heatsink at 61.2 °C TOA (Temperature Over Ambient) in a prior review. This time, running the same 140 mm Blue Vortex it held that chip to 60.8 °C TOA; which tells you that this mount was a hair better than that mount. Usually, you can expect to see wider variances. This is why I advise you to mount your heatsink several times, until you get it right. 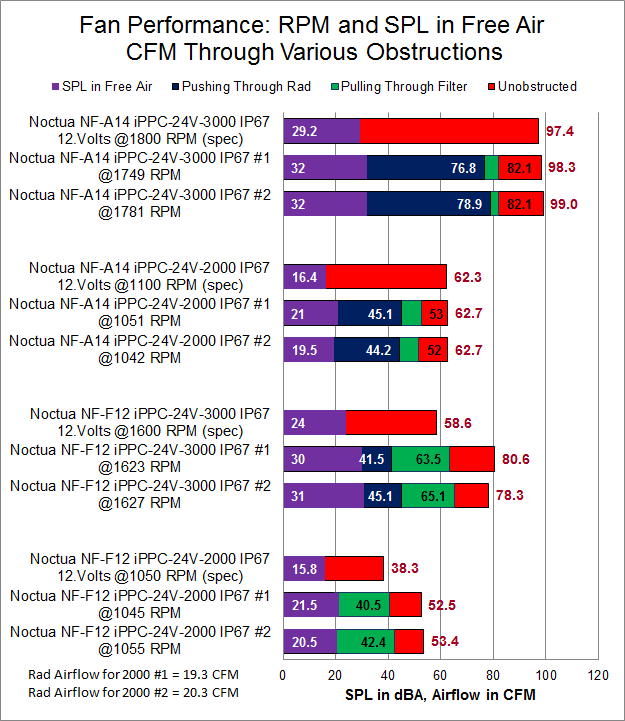 In any case, we can see that the Noctua NF-F12 iPPC-24V-2000 IP67 running at 12 volts was only 1 dBA louder than ambient. 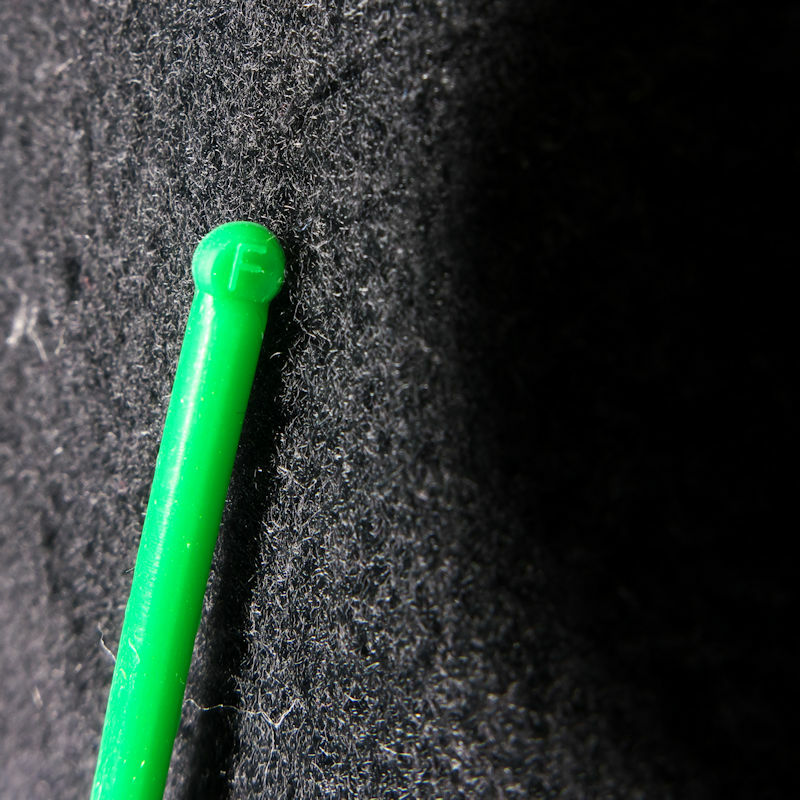 The SPL was comparable to the NF-A15 with the RP7 low noise adapter (LNA), which essentially made no noise at 1 meter. Considering that this fan kept the heatsink 2 °C cooler, 1 decibel is not much, to say the least. The Noctua NF-F12 iPPC-24V-3000 IP67 did quite well, holding this hot chip to 57.8 °C, three degrees better than the Vortex. Now, to put it all in perspective, I have graphed the TOA against the sound pressure level (SPL) of each fan. You can see the each increment of cooling is comes with more noise. Oh, one thing: these 24-volt PWM fans are running at 12 volts with no clicking. In that they are no different from their 12-volt brothers. Before Noctua’s “silent” PWM electronics, most PWM fans clicked. 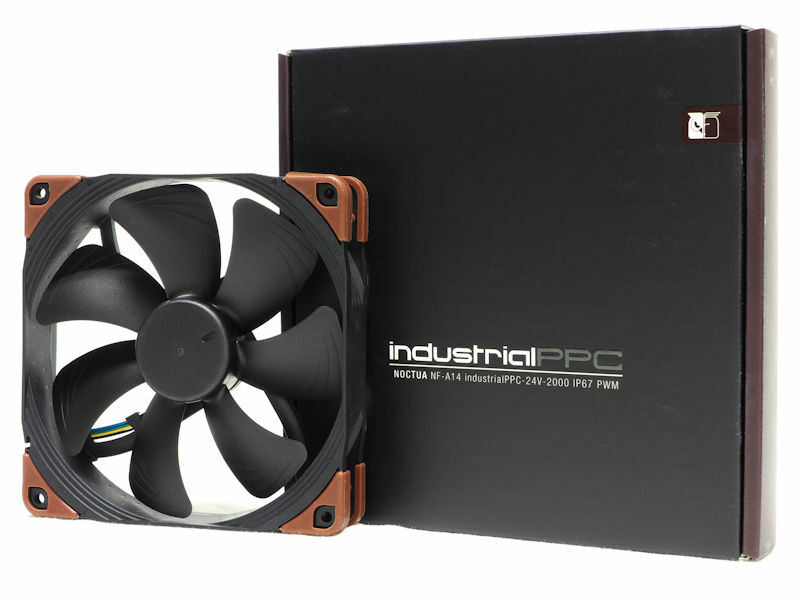 After Noctua introduced their PWM electronics, we have seen clicking in PWM fans pretty much vanish from the scene. 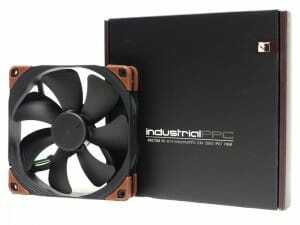 These 24-volt fans take the industrialPPC line down to lower speeds — all the way down to 1050 RPM maximum. And, as we have seen, the 3-phase motors are strong enough to maintain rotation against friction down to 123 RPM. 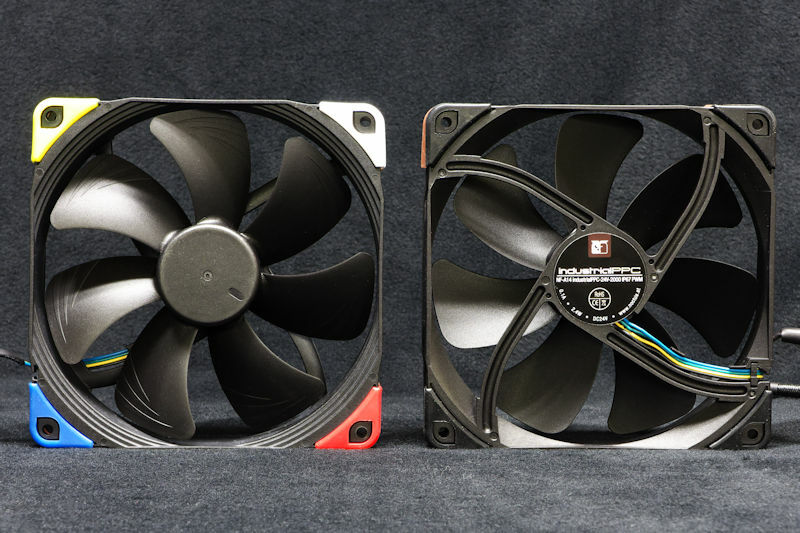 In the first chart, we saw that these fans maintain a substantial airflow through rads. That makes them perfect radiator fans. Silent when not much is demanded, but strong yet quiet when they crank up at need. 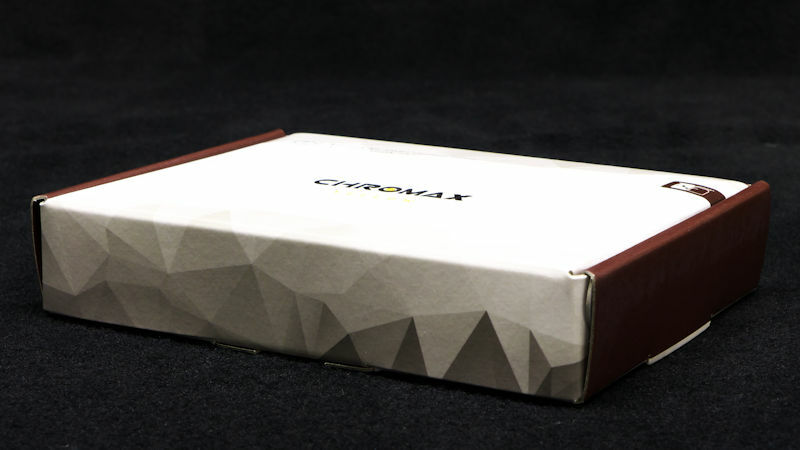 The Chromax accessories bring a flash of color to your builds. 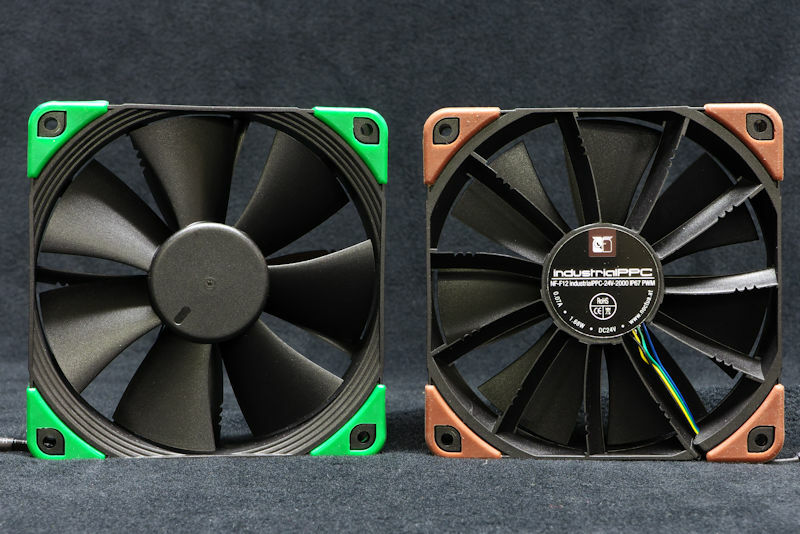 A-series fans can truly be well-dressed, and spice up your rig. 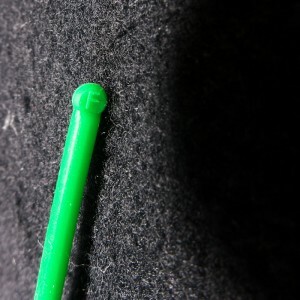 And because they are made of the same soft foam as the brown originals, they do just as well at cutting down vibrations. Awesome to see them running that low on RPM and then starting right back up. I knew they would go low, but not that low! Awesome airflow numbers, almost matching published specs even through a radiator! 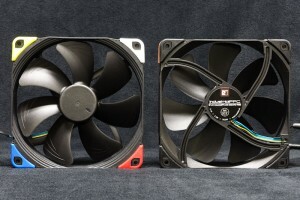 I wish I had a 30 FPI to compare the 140mm fans with, but Hardware Labs does not yet sell them. Ah, well. Maybe next year. The really important graph is, I believe, the cooling vs noise. I think it will be worth doing in some future heatsink studies, but it takes a lot of time.